Do you think Hell has nine levels, each one worse than the previous? Do you think that Hell is so hot it can burn your skin right off your body? Do you think that God’s punishment will fit the sins we commit? If so, you think that because of Dante, not the Bible. 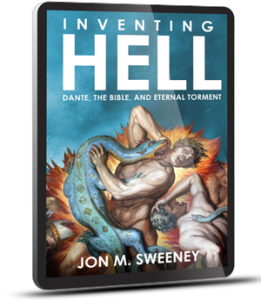 Maybe the Hell you do (or don’t) believe in is the one the Renaissance literary master Dante Alighieri described in the Inferno section of his epic poem The Divine Comedy. This is the Hell of eternal damnation that most of us were raised to fear, the place where, we are told by Dante, “Abandon all hope, you who enter here.” But it turns out that Dante’s vision of Hell is not based very much on the Hebrew or the Christian Scriptures but on an amalgam of sources from Greek and Roman philosophy to Medieval morality plays to Islam’s Qu’ranall stitched together by an accomplished artist to scare the bejesus out of all of us. Allow this book to help you reflect on what you believe about evil and what happens to bad people and just how merciful your God might be.